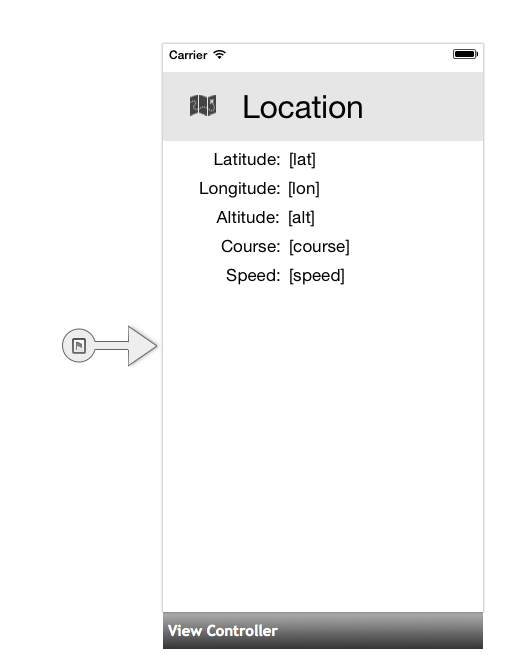 In this example, we are going to build an iOS Location application that prints information about our current location: latitude, longitude, and other parameters to the screen. This application will demonstrate how to properly perform location updates while the application is either Active or Backgrounded. This walkthrough explains some key backgrounding concepts, including registering an app as a background-necessary application, suspending UI updates when the app is backgrounded, and working with the WillEnterBackground and WillEnterForeground AppDelegate methods. First, create a new iOS > App > Single View Application (C#). Call it Location and ensure that both iPad and iPhone have been selected. A location application qualifies as a background-necessary application in iOS. Register the application as a Location application by editing the Info.plist file for the project. Under Solution Explorer, double click on the Info.plist file to open it, and scroll to the bottom of the list. Place a check by both the Enable Background Modes and the Location Updates checkboxes. Now that the application is registered, it can get location data from the device. In iOS, the CLLocationManager class is used to access location information, and can raise events that provide location updates. PausesLocationUpdatesAutomatically – This is a Boolean that can be set depending on whether the system is allowed to pause location updates. On some device it defaults to true, which can cause the device to stop getting background location updates after about 15 minutes. RequestAlwaysAuthorization - You should pass this method to give the app user the option to allow the location to be accessed in the background. RequestWhenInUseAuthorization can also be passed if you wish to give the user the option to allow the location to be accessed only when the app is in the foreground. AllowsBackgroundLocationUpdates – This is a Boolean property, introduced in iOS 9 that can be set to allow an app to receive location updates when suspended. iOS 8 (and greater) also requires an entry in the Info.plist file to show the user as part of the authorization request. Add a key NSLocationAlwaysUsageDescription or NSLocationWhenInUseUsageDescription with a string that will be displayed to the user in the alert that requests location data access. iOS 9 requires that when using AllowsBackgroundLocationUpdates the Info.plist includes the key UIBackgroundModes with the value location. If you have completed step 2 of this walkthrough, this should already been in your Info.plist file. There are several important things happening in this method. First, we perform a check to see if the application has access to location data on the device. We verify this by calling LocationServicesEnabled on the CLLocationManager. This method will return false if the user has denied the application access to location information. Next, tell the location manager how often to update. CLLocationManager provides many options for filtering and configuring location data, including the frequency of updates. In this example, set the DesiredAccuracy to update whenever the location changes by a meter. For more information on configuring location update frequency and other preferences, refer to the CLLocationManager Class Reference in the Apple documentation. Use the iOS designer to build the screen that will display location information. Double-click on the Main.storyboard file to begin. On the storyboard, drag several labels onto the screen to act as placeholders for the location information. In this example, there are labels for latitude, longitude, altitude, course, and speed. This will start the location updates on application start-up, although no data will be displayed. // resume when the application re-enters the foreground! There is one remaining issue with the code: attempting to update the UI when the app is backgrounded will cause iOS will terminate it. When the app goes into the background, the code needs to unsubscribe from location updates and stop updating the UI. iOS provides us notifications when the app is about to transition to a different application states. In this case, we can subscribe to the ObserveDidEnterBackground Notification. The application prints location updates to the screen when operating in the foreground, and continues to print data to the application output window while operating in the background. Only one outstanding issue remains: the screen starts UI updates when the app is first loaded, but it has no way of knowing when the app has re-entered the foreground. If the backgrounded application is brought back into the foreground, UI updates won’t resume. Now the UI will begin updating when the application is first started, and resume updating any time the app comes back into the foreground. In this walkthrough, we built a well-behaved, background-aware iOS application that prints location data to both the screen and the application output window.